When I turned 30, I suddenly started dealing with dry skin. My birthday is in the summer, right before crazy humidity tends to kick in, but it seriously felt like the very week of my 30th birthday my skin became noticeably drier. I also sprouted three gray hairs (one for each decade) and hoppy beers stopped agreeing with my stomach that week, but I digress. This year, my pregnancy coincided with the onset of fall and winter which has left me with a perfect storm of dry skin (thanks, hormones). To combat it, I've doubled down on moisturizing. I mist a generous amount of moisturizing toner then apply a protective serum and a face oil. This mist from Marie Veronique, although I also really love this one, which has hyaluronic acid in it (although honestly I wish the mister was more of a true mist and less of a spray for application). I subscribe to the theory that if you're going to splurge on skincare you should put money into your serum. Marie Veronique's Barrier Restore Serum is definitely speedy, but it has been key to sorting out my parched skin. It's also been so popular that it's sold out at numerous retailers that carry the Marie Veronique line. 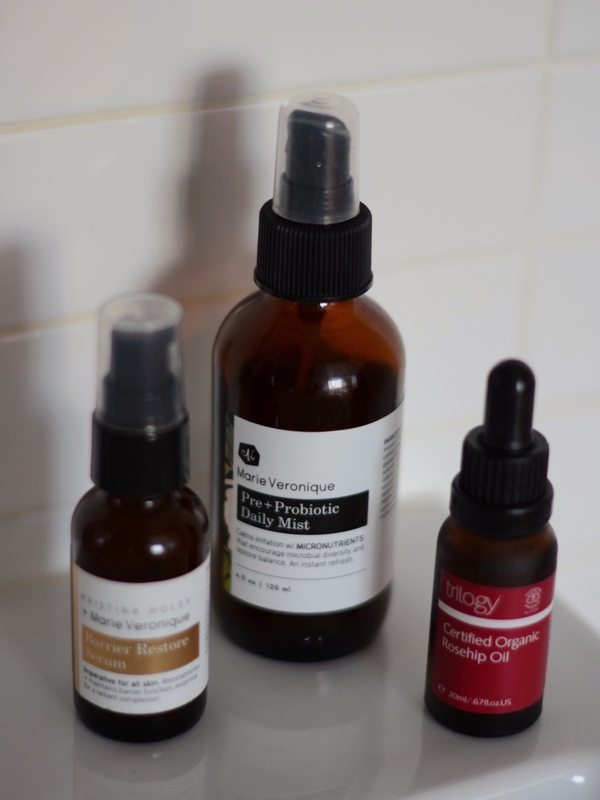 To balance out the cost of the serum, I've found less pricey face oil from Trilogy, which I pick up at Whole Foods. I also use only 1-2 pumps of the serum and 3 drops of the oil each time I apply. A little bit does go a long way with these! I also swear by Jao's Face Cream, which is seriously moisturizing, has a great feel and smells delightful - and is $60 for a big tube. I use it as night cream all year, plus during the day to combat any winter-induced dry patches. It's not pictured above only because I recently ran out of it! So that's it, my whole recipe for sorting out my super dry skin.